The impact of poor Internet access goes far beyond one's ability to watch Netflix or check their Twitter feed to stay up-to-date. 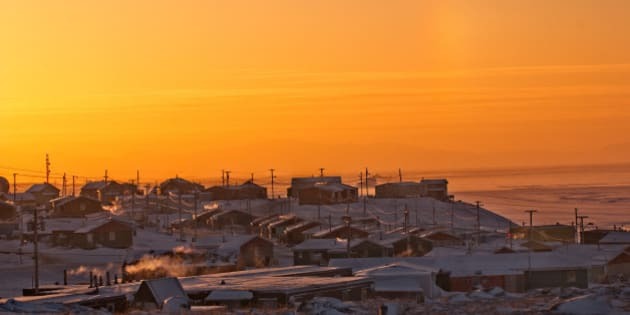 The lack of high speed and adequate bandwidth means limited access for Nunavummiut to pursuing everyday practical tasks: online banking, tax filing services, job hunting and applications, and email. Pond Inlet, Nunavut, Canada, Inuit community Baffin Island. Sunset in Winter, good copy space. The consultation process for Canada's upcoming Poverty Reduction Strategy (CPRS) is ramping up, with a number of opportunities for people across Canada to participate in the process online. People from coast-to-coast-to-coast have been invited to fill out an online survey or send their questions to the upcoming online Facebook town hall. Outside of the government, civil society organizations, like Canada Without Poverty, have used other online methods including a platform for video testimonials to support and inform the CPRS process. It appears that online surveys have become the modus operandi of this government. Beyond the poverty strategy, the government has been using this tool to gather perspectives on a number of other key policy areas for those living in the North from housing, to nutrition, to child and family services, to government relations with First Nations. In a country as vast as Canada with high rates of connectivity, the Internet is an obvious tool for democratic participation. Or is it? For most of us in the South, the World Wide Web is always at our fingertips. But on a recent trip to Nunavut, I experienced what it's like to live without it. My education on the vagaries of Internet access started immediately at hotel check-in: a typed note was in my room asking that guests be patient with the poor Internet connection. Where there was access - in hotels and at the offices of colleagues--the loading wheel on my browser circled endlessly until pages crashed, to the point of not being able to do tasks I'd consider pretty normal, like check my email or book a flight. And this was in Iqaluit. I was told that for the 24 communities outside of Iqaluit, the Internet is even less reachable. According to the Canadian Radio-television and Telecommunications (CRTC), while the average person in Canada downloads 66.5 GBs per month, the most popular Internet packages in Nunavut are capped at 10 GBs per month. The territory is only accessible by airplane or boat - there are no roads to or between communities - and so rather than fibre optic cables, Internet access is satellite-based. As reported by the Financial Post, while the average broadband speed in Canada is 44 megabit per second (Mbps) - with an average mobile speed of 25 Mbps, in Nunavut the average speed of mobile data is somewhere between 1 and 3 Mbps, a significant decrease. The impact of poor Internet access goes far beyond one's ability to watch Netflix or check their Twitter feed to stay up-to-date. The lack of high speed and adequate bandwidth means limited access for Nunavummiut to pursuing everyday practical tasks: online banking, tax filing services, job hunting and applications, and email. For those in poverty in the territory, the cost of having even the most limited Internet plan is $25 a month for 2 GB, with additional pricing set at $10 to $15 per GB - compare this with southerners who can purchase one terabyte of data for $50. But worse yet is the impact on participatory democracy - the ability of Canada's Northerners to engage in political and public life. For people in parts of the territories, their geographic location already results in a lack of visibility in policy development. Without adequate Internet access, their voices and experiences are excluded from the laws, policies, and programs that most affect them. Under the current conditions, online consultation initiatives are not sufficient to ensure the inclusion of people living in poverty in the North. And while some consultations host in-person meetings in Nunavut - particularly in Iqaluit - for many initiatives, such as the Canadian Poverty Reduction Strategy, no in-person consultations or community meetings are listed for the territory. Seven out of ten Inuit preschoolers live in food insecure households - while 39% of the population in 2014 received social assistance benefits. With statistics like these, it's critical that the voices of those in the North, particularly in Nunavut, are included in consultations on poverty policy. While Canada can boast being one of the most connected countries on the planet, this status cannot be confused with our competency as a democratic society with inclusive and active participation. It's no easy task to connect with everyone across the vast geography of our country. But we can do it - starting with a commitment to spend enough resources to ensure that everyone can connect virtually. And in the meantime, it's up to our governments to work together have to make the necessary efforts to make sure all Northerners have an outlet for their voices.